Cellulosic ethanol is on the brink of entering the U.S. market with three plants scheduled to go on line over the next 12 months. In early October, members of the North American Agricultural Journalists got a chance to see the progress of one of those plants at Nevada, Iowa, and to tour an adjacent traditional plant operated by Lincolnway Energy, which will be working with cellulosic owner DuPont to maximize the use of infrastructure. John Pieper, who is working directly with farmers to obtain feedstock, primarily corn stover, for the new DuPont plant, addressed journalists on Oct. 15. 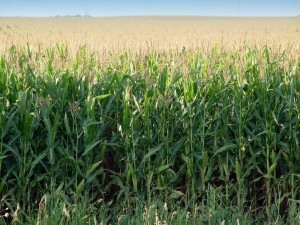 Pieper said there are 800,000 acres of corn production within a 30 to 35-mile radius of Nevada with production in excess of 200 bushels per acre. “Our estimates are that we need only about 25% of the stover in that region for our projected production of 30 million gallons per year,” Pieper said. The DuPont plant represents a $228 million investment. It sits on a 59-acre site and will have 80 full time employees. It is located just west of the Lincolnway plant and will share some infrastructure with that plant, including rail access. The Lincolnway plant also plans to burn lignin from the DuPont plant as fuel. Fagan is the contractor for the DuPont plant and was also the builder of the Lincolnway plant, which utilizes distillation technology from ICM Inc. of Colwich. Pieper said the value to producers from cellulosic stover gathering starts with a direct payment of $18 to $20 per acre. But there are other benefits, including the fact that DuPont provides the labor of stalk chopping, freeing producers from that cost. Removing the stover also helps the producer save fuel because he does not have to engage his combine head chopper, and he is able to reduce tillage and save fuel because he does not have to manage excess residue. Pieper said he expects other advantages to Iowa farmers to emerge as the process moves forward.